“When the Goblin appears on your path, your plans are, or are about to go, awry. The Goblin wants to lead you astray and whispers the negative spell of fear, anger, resentment, self righteousness, arrogance, selfishness, greed, gluttony, procrastination and addiction. When the Goblin appears, it is time to stop what you are doing and check your motives. Are you coming from an ego centered place? Are the circumstances in your life triggering unresolved past issues that still need healing? Now is the time for self evaluation and taking inventory, before you take another step. 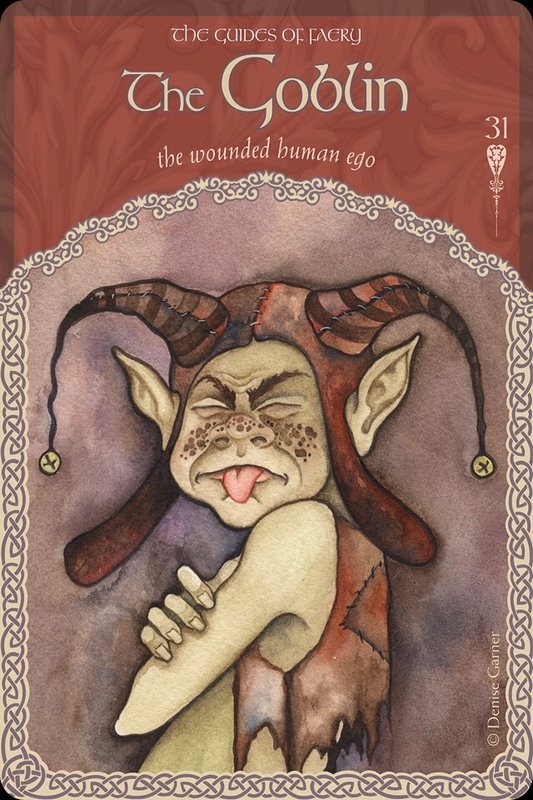 The Goblin represents the wounded ego and its influence. Dark, repressed areas of the psyche get triggered… either in you, or warning you of a dynamic between you and someone else. Although this may seem like a negative message, it is not, it is simply a reminder that we are human, and as humans, we are reactive to what is going on around us. When we are feeling hurt, we often feel like we want to hurt back; get revenge on those who have hurt us… hurt them more than they hurt us. This could create a snowball effect, one person hurting another, who goes to hurt the next and so on… yet it can very easily be turned around. What is most important is that we keep people and situations, and the feelings they stir within us, in perspective. And also that we stay mindful and have compassion for those around us who may be more reactive today. It is quite possible that this has nothing to do with us and we just need to walk away and let it go instead of getting wrapped up in unnecessary drama! When people come to teach us a lesson, it is often one we are resistant to learning. We may take on the roll of the victim, feeling that this person is abusing us in some way. We may spend so much time entangled with the situation that we quickly lose perspective. Sometimes we even break away from that particular person, only to find ourselves in an even more exaggerated, yet extremely similar situation with another person. This is where patterns are created and we can fall in to the vortex of repeating them over and over until we finally…. FINALLY get the message! If only we would just learn the lesson and move forward! It would be so much simpler in the long run. But there is nothing simple about humans, that much is certain. Of you are experiencing a power struggle in any area of your life, either internally or externally with another person, look closely at what is actually going on. Ask yourself the question: ‘How can I love more?’ See the light in the other person connecting to the light in you. Feel the connection. Own your part. Send them blessings and walk away from the struggle, giving yourself time to breathe. Know that in some way, this is making you stronger. Bless this lesson. Embrace it with love. And your problems in this situation will fade away. Or not, but you will feel a whole lot better either way! How can we love more?